Family Travel Blog : Which Hawaiian Island should I visit? When you think of Hawaii what do you picture? Fluted mountains? Waikiki beach with Diamondhead peering out in the distance? What about snow? Mars like terrain? Secluded beaches? Hawaii is everything people dream it to be. There are stunning beaches, rainbows, great food, a fascinating culture and amazing underwater life. But Hawaii is also so much more than all that. After living here now for over 2 years we have explored quite a bit of the state and are often asked what is the best area to come when visiting. With 4 main islands, 3 smaller ones, and literally hundreds of tiny uninhabited islands this is a harder question to answer than some might think. Really in an ideal world you would be able to do a multi center island hopping adventure around the state. If you have the time and energy for that then you can hit all these spots. For many though in a weeks time that is simply not doable and then the question remains; Which Hawaiian island should I visit? The Big Island, also known as simply Hawaii, is a great island for families. The diversity in the landscape and opportunities for learning experiences are endless and make a great spot to take people of different generations and with different preferences. There are incredible opportunities to learn about astronomy at Mauna Kea, geology at Hawaii Volcanoes National Park, and all things ocean just about every turn you make. There are also incredible cultural and language opportunities, hiking adventures, unique and difficult to get to beaches, and on the Kona side even chances to swim with wild dolphins. Pretty much something for everyone! You can even ski on the island if the timing is right. Bottom line: If you love volcanoes or are just interested in seeing one of the most accessible active volcanoes in the world head to the Big Island, just be sure you are OK with driving a bit as all the amazing things on offer are spaced farther apart than you might think! For families this island is a home run! City lovers will find everything they need on Oahu, the most popular of all the islands. Those that are looking to shop will find Waikiki to be an amazing spot, as long as the pockets are deep. The city is a really fun place to be but what I always tell people is to get out of the city because Oahu is so much more than the overcrowded beaches and sidewalks of Waikiki and Honolulu. We spent 8 months living on Oahu and did not visit the city much at all, in fact there are so many beautiful beaches that we didn't even get a chance to see them all in all the months we were there. Oahu is also an amazing spot for ridge hikes, waterfalls, shrimp truck treats, and incredible underwater life. We swam with dolphins, did a shark cage adventure, and even played at a Wet N Wild, the kind of spot you won't find on the other islands. Bottom line: If you want a mix of nature at its most beautiful, great beaches, and that dab of city life than Oahu is the only way to go! Families won't be bored on this island either! Maui is a wonderful in between of the busy city life and tourism on Oahu and the laid back, slowed down country vibe of the Big Island. If being a beach bum and simply relaxing to the sound of waves crashing on shore is what you are seeking then this is the island for you. There are stretches of powdery white sand that go on for mile upon mile so you could spend weeks visiting a new spot every day. There is also just enough touch of tourism to leave you with cute little towns and many great restaurants to enjoy. Maui is also known for its beautiful sunrise at the peak of Haleakala's summit, lavender fields, whales in the winter months, and ease of access to 2 other beautiful Hawaiian islands; Molokai and Lanai. Bottom line: Beaches, beaches, beaches are what it's all about on this island. If you just need to be in or near the water every moment than this is the spot for you. If you are going in the winter and whales are a must see then Maui is your spot as well. We see whales on all the islands but the warm channel between the smaller islands and Maui make it the perfect spot for them and where we always see the most each year. Kauai is the smallest of the main islands and its beauty is really unmatched anywhere else in the island chain. Everything from stunning calm beaches to wicked waves on the North shore and deep valleys in the interior canyon to the rugged and stunning coastline is what you can experience on this small island. Bottom line: If you love adventure, challenging hikes, crazy kayaking experiences, and wicked North shore surf then this is the spot for you! 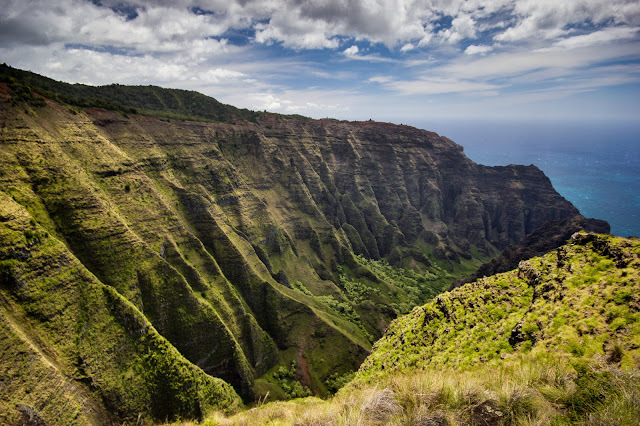 Of course all the islands offer these things but Kauai is a whole other level of adventure! I know some will argue that all the islands are great for nearly all these things. I actually quite agree. As a family we've loved each island, as hikers we've loved each island, and as beach goers we've also loved all the islands but each island has a distinct feel so although you can really have it all on any island and I know you won't be disappointed by a stay however short in paradise we feel each island has it's strong points. I'd love to hear your feedback! Which island did you choose? Do you think it was the right fit? Why or why not? Let us know in the comments below!